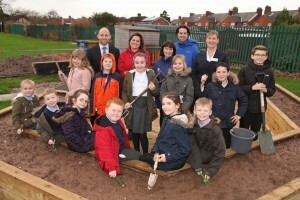 Green fingered pupils enjoy new allotment with support from David Wilson Homes North West – Our Space, Your Place. As part of the Our Space Your Place scheme David Wilson Homes has helped St Chad’s Primary School to transform their playground. Pupils at St Chad’s C of E Primary School in Winsford, have unveiled their stunning new allotment, thanks to assistance from David Wilson Homes North West (DWH North West). The school successfully applied for funds through DWH North West’s charitable and community scheme, Our Space, Your Place, enabling it to transform a former disused play area in its grounds into an allotment space. Along with a large consignment of top soil, the house builder contributed a £1000 cash donation to fund fencing works. As well as financial support, the school successfully drummed up practical help from other local businesses and organisations including Cheshire Fire Service’s Prince’s Trust volunteers, who took up the challenge to design and create the allotment. Andrew Taylor, Our Space, Your Place Project Coordinator and Planning Director at DWH North West, comments: “At David Wilson Homes, we are privileged to get to know the communities in which we build homes. Supporting local causes which benefit those living close by is very important to us.